The following provides technical details on the OME-TIFF format. It assumes familiarity with both the TIFF and OME-XML formats, although there is some review of both. a string of OME-XML metadata embedded in the ImageDescription tag of the first IFD (Image File Directory) of each file. The XML string must be UTF-8 encoded. Note that BigTIFF-specific file extensions are an addition to the original specification, and software using an older version of the specification may not be able to handle these file extensions. This string is a standard block of OME-XML, except that instead of storing pixels as BinData elements with base64-encoded pixel data beneath them, it references pixels with TiffData elements that specify which TIFF IFD corresponds to each image plane. As such, the OME-XML string can be regarded as a “metadata block” because the actual pixels are stored within the TIFF structure, not the XML. The diagram OME-TIFF header (adapted from the TIFF specification) shows the organization of a TIFF header along with the placement of the OME-XML metadata block. Note this is for the TIFF standard specification only; the header structure is slightly different for BigTIFF; see the BigTIFF file format specification. A TIFF file can contain any number of IFDs, with each one specifying an image plane along with certain accompanying metadata such as pixel dimensions, physical dimensions, bit depth, color table, etc. One of the fields an IFD can contain is ImageDescription, which provides a place to write a comment describing the corresponding image plane. This field is a convenient place to store the OME-XML metadata block—any TIFF library capable of parsing IFDs and extracting an ImageDescription comment can easily obtain an OME-TIFF file’s entire set of metadata as OME-XML. 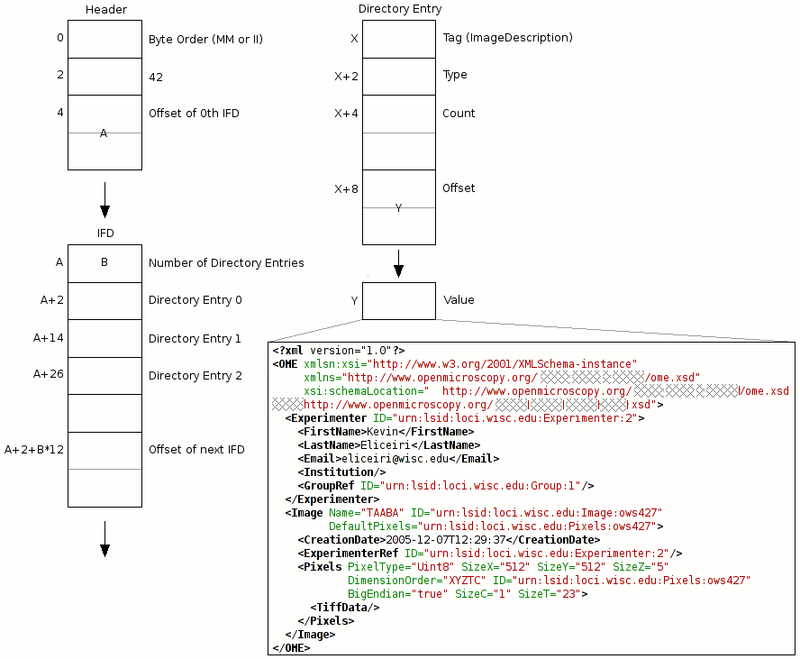 A TIFF file contains one IFD per image plane, but the OME-XML metadata block is stored only in the first IFD structure. However, for an image sequence distributed across multiple OME-TIFF files, each file will contain a copy of the OME-XML metadata block (see Partial OME-XML metadata below for exceptions to this rule). Thus, if any files are lost, the metadata is preserved. The OME-XML block in each file is nearly identical—the only difference is in the TiffData elements appearing beneath Pixels elements, since each TIFF file contains a different portion of the image data (see Multi-file OME-TIFF below). As mentioned above, the standard OME-XML format encodes image planes as base64 character blocks contained within BinData elements beneath a Pixels element. The Pixels element has a DimensionOrder attribute that specifies the rasterization order of the image planes. For example, XYZTC means that there is a series of image planes with the Z axis varying fastest, followed by T, followed by C (e.g. if a XYZTC dataset contains two focal planes, three time points and two channels, the order would be: Z0-T0-C0, Z1-T0-C0, Z0-T1-C0, Z1-T1-C0, Z0-T2-C0, Z1-T2-C0, Z0-T0-C1, Z1-T0-C1, Z0-T1-C1, Z1-T1-C1, Z0-T2-C1, Z1-T2-C1). Since a multi-page TIFF has no limit to the number of image planes it can contain, the same scheme described above for specifying the rasterization order works within the OME-TIFF file. The only difference is that instead of the pixels being encoded in base64 inside BinData elements, they are stored within the TIFF file in the standard fashion, one per IFD; see the TiffData element below for specifics. cautiously (if at all), and back up the original data before doing so. As the illustration OME-TIFF header shows, all that is needed to indicate that the pixels are located within the enclosing TIFF structure is a TiffData element with no attributes. By default, the first IFD corresponds to the first image plane (Z0-T0-C0), and the rasterization order of subsequent IFDs is given by the Pixels element’s DimensionOrder attribute, as described above. IFD - gives the IFD(s) for which this element is applicable. Indexed from 0. Default is 0 (the first IFD). FirstZ - gives the Z position of the image plane at the specified IFD. Indexed from 0. Default is 0 (the first Z position). FirstT - gives the T position of the image plane at the specified IFD. Indexed from 0. Default is 0 (the first T position). FirstC - gives the C position of the image plane at the specified IFD. Indexed from 0. Default is 0 (the first C position). PlaneCount - gives the number of IFDs affected. Dimension order of IFDs is given by the enclosing Pixels element’s DimensionOrder attribute. Default is the number of IFDs in the TIFF file, unless an IFD is specified, in which case the default is 1. The default TiffData tag simply assigns every IFD to a position according to the given DimensionOrder rasterization. If the TIFF file has more than SizeZ*SizeT*SizeC (3*2*2=12 in this case) IFDs, the remaining IFDs are extraneous and should be ignored by OME-TIFF readers. When specified, the PlaneCount attribute gives the number of IFDs affected by the TiffData element. In this case, even though the Pixels element defines 4*3*2=24 image planes total, the TiffData element assigns only 10 planes. The remaining 14 planes are unspecified and hence lost. States that the rasterization begins at the fourth IFD (IFD #3), and continues for five planes total. IFDs #0, #1 and #2 are not used, and should be ignored by OME-TIFF readers. Any number of TiffData elements may be provided. In this case, the dimensional positions of each of the first six IFDs are explicitly defined, effectively overriding the rasterization given by DimensionOrder, storing the planes in reverse temporal order. For details on validating your OME-XML metadata block, see the validating OME-XML section on the Extracting, processing and validating OME-XML page. As demonstrated above, the OME-TIFF format is capable of storing the entire multidimensional image series in one master OME-TIFF file. Alternatively, a collection of multiple OME-TIFF files may be used. Using the TiffData attributes outlined above together with UUID elements and attributes, the OME-XML metadata block can unambiguously define which dimensional positions correspond to which IFDs from which files. Each OME-TIFF need not contain the same number of images. The only difference between the OME-XML metadata block per TIFF file is the UUID attribute of the root OME element. This value should be a distinct UUID value for each file, so that each TiffData element can unambiguously reference its relevant file using a UUID child element. The FileName attribute of the UUID is optional, but strongly recommended—otherwise, the OME-TIFF reader must scan OME-TIFF files in the working directory looking for matching UUID signatures. When splitting an OME-TIFF across multiple files, the OME-XML metadata must either be embedded into each TIFF file or use partial metadata blocks. In the first case, a nearly identical OME-XML metadata block must be inserted into the first IFD of each constituent OME-TIFF file. The MetadataFile element should contain the name of the master file containing the full OME-XML metadata block and UUID should contain the UUID of this master file. The master file containing the full OME-XML metadata should be either an OME-XML companion file with the extension .companion.ome or a master OME-TIFF file containing the full metadata (see Multi-file OME-TIFF filesets for representative samples).